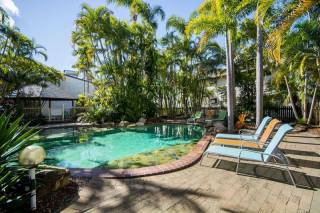 The Palms is one of Hervey Bay’s leading destinations offering modern accommodation in the heart of Hervey Bay, Queensland. The relaxed atmosphere of The Palms is only 300m from the Charlton Esplanade, beach front – the hub of Hervey Bay’s wide variety of restaurants, cafe’s and shops and, the beautiful Torquay Beach, where the warm, clear and pristine waters of Hervey Bay offer safe swimming all year round. After extensive renovations, The Palms is one of the top destinations with a variety of holiday accommodation from 28ft powered camp sites surrounded by gardens, luxury brand new condo’s to deluxe villa’s perfect for large families. 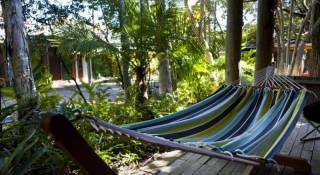 At the best rates in Hervey Bay, The Palms offers 4 star accommodation and facilities in a premier location. If you're looking for accommodation in Hervey Bay Queensland Australia look no further than our beautifully maintained caravan and camping park. We offer top class deluxe and standard cabins, all fully self contained and suitable for singles through to families. We are a pet friendly park so pets are welcome on any one of our dog friendly caravan and camping sites (sorry but our 3.5 star cabins are not dog friendly - pets are welcome but only in your own accommodation). The Palms Caravan Park aims to provide the highest quality service to all of its guests to ensure your stay in Hervey Bay is enjoyable, relaxing and stress free. Hervey Bay is not only the Whale Watch Capital, but also the Gateway to the World Heritage Listed, Fraser Island. Our staff offer a free booking service for all attractions. On behalf of the managers, we wish you an enjoyable and comfortable stay. Please read these terms and conditions carefully, in order to make your stay as pleasant as possible. By entering The Palms and providing payment, you have agreed to observe the following terms and conditions. Online Bookings - The full value of the online booking will be deducted from the nominated credit card at the time of reservation. Check-in - Check-in times for caravan sites is 11:00am and cabins 2:00pm. When you check-in, you will be asked to provide photographic identification and full payment including a bond, if applicable. Departure - Check out time is 10:00am, please inform the reception if you wish to retain your cabin or site beyond this time. Extension will be given depending on the availability. On failure of the guest to vacate the cabin or site on expiry or period, the management shall have the right to remove the guests and his/her belongings from the cabin occupied by the Guest. Guest Pets - Pets are not permitted to be inside the cabins. Whilst pets are welcome at The Palms, pets must be on a leash at all times, are not permitted to bark excessively and, the owners must pick up all droppings. A bond of $50 applies for all guests with pets, which is fully refundable on departure if the pet owner abides by these terms and conditions and, the pets agreement. Hazardous Goods - Bringing goods and / or storing of raw or exposed cinema films, or any other article of a combustible or hazardous nature and / or prohibited goods and / or goods of objectionable nature is prohibited. Guest Behaviour - We do not permit offensive language, loud or disturbing behaviour including but not limited too: gambling, contraband, prostitution, weapons, explosives, flammable objects, drugs and pungent food are strictly prohibited at the Palms. Damage to Property - The guest will be held responsible for any loss or damage to the cabin or facilities caused by themselves, their guests or any person for whom they are responsible. Maximum Occupancy - The maximum occupancy per caravan site or cabin is limited to (6) six persons including any adult and child. Additional occupancy fees apply for increased occupancy above the standard rates. Vehicle Parking - Ample guest parking is available on Truro Street and the surrounding streets, only one vehicle per caravan site or cabin is permitted within the grounds. Children Under 10 - Children under 10 must be accompanied at ALL times by an adult at the Pool, Camp Kitchen and Bathroom. Off Peak Booking Cancellations - If you cancel your booking the following charges will apply in relation to each booking: Up to 14 days prior to your scheduled check-in time: a cancellation fee equivalent to 25% of the booking will be deducted from any monies which you have already paid. Up to 30 days prior to your scheduled check-in time: no cancellation fee will be deducted. Peak Season Booking Cancellations - If you cancel your booking the following charges will apply in relation to each booking: Up to 14 days prior to your scheduled check-in time: a cancellation fee equivalent to 50% of the booking will be deducted from any monies which you have already paid. Up to 30 days prior to your scheduled check-in time: a $50 cancellation fee will be deducted and, a full refund is available at the managers discretion. Guest’s Belongings - Guests are particularly requested to lock the door of their cabins and caravans when going out or going to bed. For the convenience of the guest, the Management will not in any way whatsoever be responsible for any loss / or damage to the Guest’s belongings or any other property from either the cabin or any other part of the park for any cause whatsoever including theft of pilferage. The Guest shall be solely liable and responsible to the management, its other guests, invitees visitors, agents and servants for all loss financial or otherwise and damage that may be caused by such articles or as a result of the guests’s own negligence and non-observance of any / instructions or the above terms and conditions. The city of Hervey Bay lies on the Fraser Coast a scenic 3 hours drive north from Brisbane and only 45 minutes by air from Brisbane. It boasts warm sub-tropical days and safe swimming beaches all year round and with over 1.2 million visitors per year. Hervey Bay is known as the Whale Watch Capital of Australia. hale Watching is popular in Hervey Bay as it is one of the only places in the world where the Humpback Whales seem to befriend their whale watchers, swimming and playing around the vessels and putting on some amazing acrobatic shows for their audience. Hervey Bay is also the gateway to the world heritage listed, Fraser Island. The largest Sand Island in the world is classed as one of the best sand four wheel driving terrains in the world with unique flora and fauna.